From bridge operators and water taxi drivers to crew team members and kayakers, people intersect with the Chicago River every day, each at different scales and trajectories. By spending time in and around the river, people build crucial connections with the vast yet fragile regional watershed that propels our city’s economic, ecologic, and industrial systems. Expanding access along the river, as well as the type and scale of these access points, will likewise expand opportunities for many more people to experience the waterways and become stewards of the river. 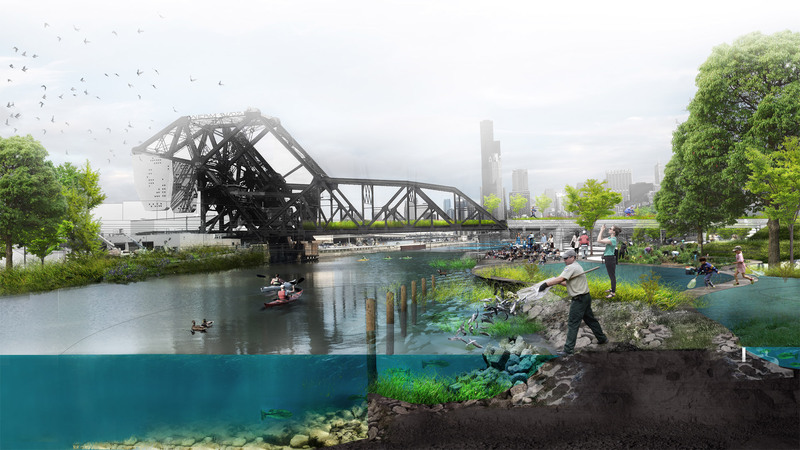 While transformative developments are underway along the North Branch and Main Stem of the River, momentum around the South Branch has been slower to catalyze yet is currently gaining steam. Tapping into a growing interest in recreation in and around the river, the creation of a new continuous network of public pathways and spaces moving south along the river, has the potential to redefine our relationship with the river’s South Branch, connecting people and communities. 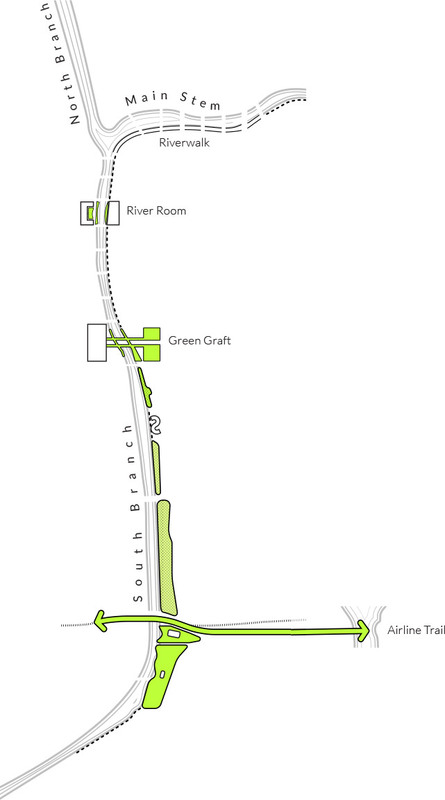 To achieve this network, Studio Gang’s Riparian Reclamation concepts build upon what is working well at each site to inform how people can inhabit, connect to, and repair the river at varying scales. 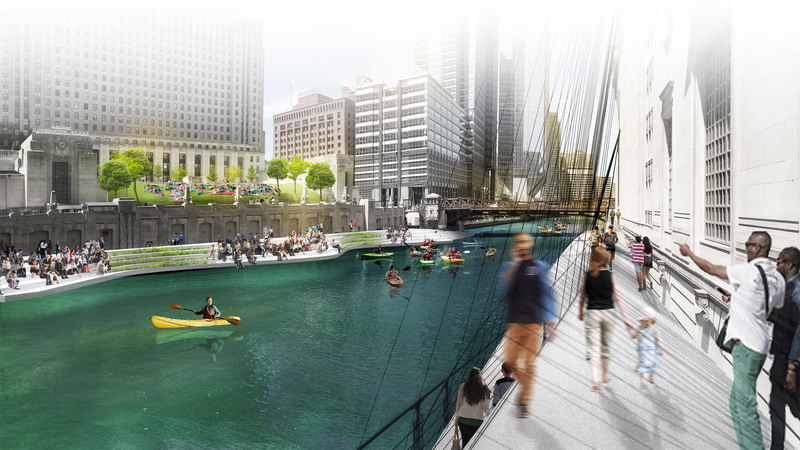 The concepts imagine new experiences and architectural spaces for people while also zooming out to anticipate how interventions along the edge of the South Branch will have an impact on the fabric of natural and man-made systems that define our regional waterways. 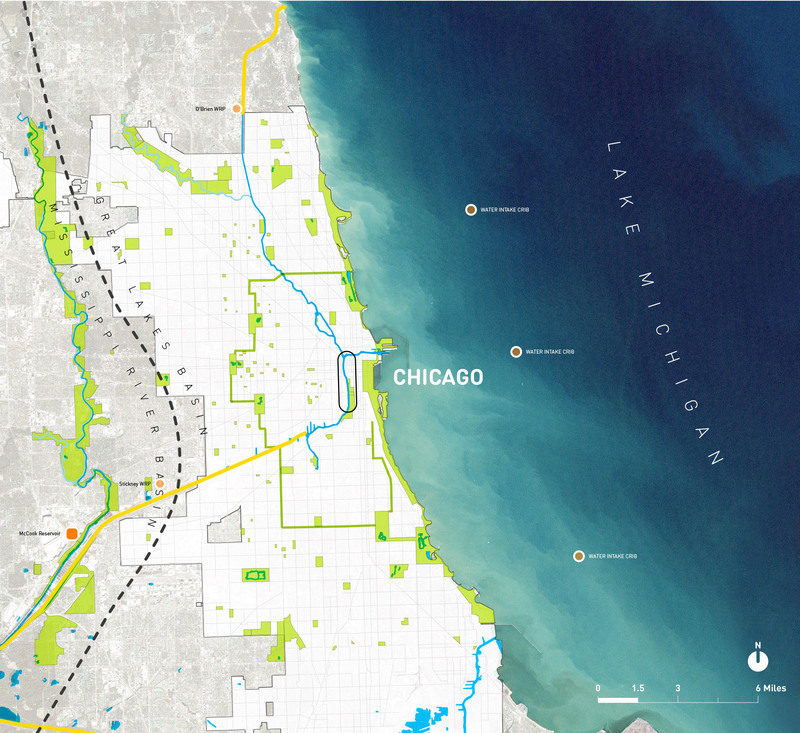 The Chicago Blue-Green Network is shaped by the forces of nature, industry, commerce, and politics at local, national, and international scales. 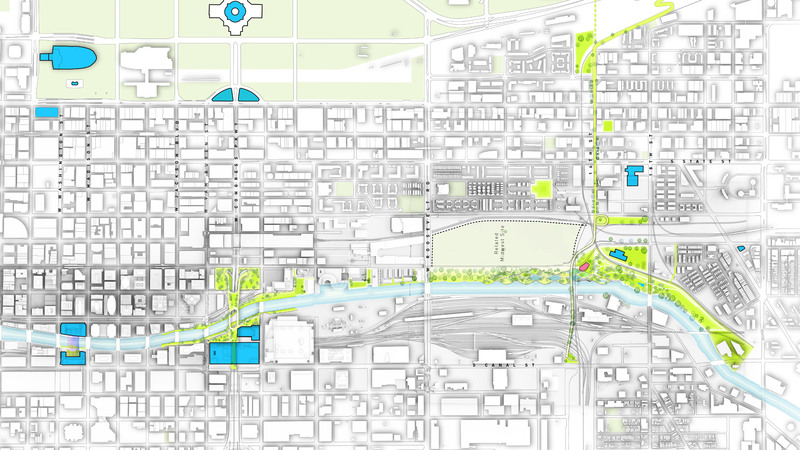 The development of a continuous South Branch pedestrian and bicycle path with accessible connections will build on the evolution of Chicago’s public parks, offering new types of spaces for recreation, and transportation, and education. 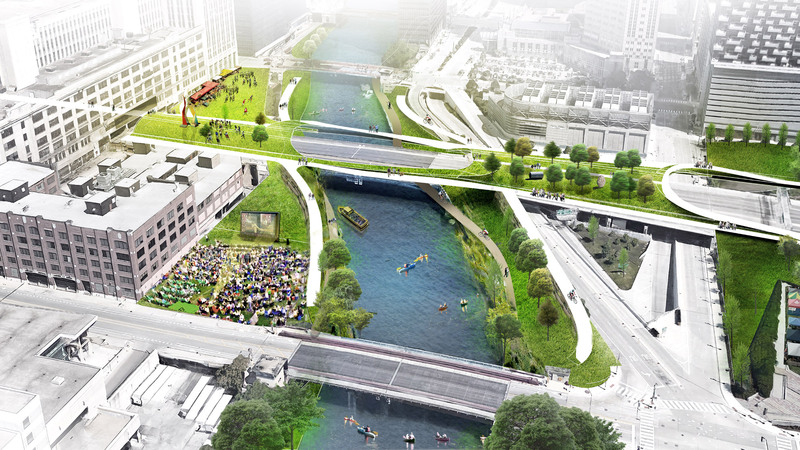 ‍The North and Main Branches of the Chicago River enter the fork at Wolf Creek and flow into the South Branch. Everything about the South Branch is seemingly artificial—the direction the water is flowing, the hard edge lining the river, and the tall buildings rising from the surrounding dense city grid. It is nothing like the low prairie and swampy marsh that once defined the area. Founded by MacArthur Fellow Jeanne Gang, Studio Gang is an architecture and urban design practice based in Chicago and New York. Internationally recognized for a design process that foregrounds relationships between individuals, communities, and environments, the Studio works across scales and typologies, from cultural institutions to tall mixed-use buildings to urban plans. Recent projects include the Memphis Riverfront Concept, which reimagines six miles of the city’s historic riverfront, and the Eleanor and WMS Boathouses on the Chicago River, which play a key role in the city’s ongoing efforts to transform the river from an industrial waterway into a public amenity.